Starrett Countersink Gages are offered in three different angles so that the gage sets on the angular side of the countersink, as opposed to a chamfer gage which sets on the top edge of the chamfer. This gage directly reads the large diameter of the countersink in .002" or 0.05mm increments. 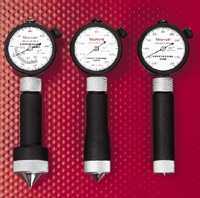 A set master ring is furnished with each gage for calibration and setting. Press the button on top of the indicator to firmly depress the gage head into the countersink. When the gage is removed, the indicator reading is held in place until the reset button is activated.